Federal Member for Gippsland Darren Chester met with Ensay-Swifts Creek RSL vice president Ken Skewes to see the new World War One commemorative information board erected at Reedy Flat with $6,850 in Australian Government funding to mark 100 years since the end of the First World War. The communities of Ensay and Swifts Creek have honoured the memory of the 33 locals who fought during World War One, including nine who died, never to return to the district. To mark 100 years since the end of the Great War, the Ensay-Swifts Creek RSL has erected a commemorative information board next to the World War One memorial at Reedy Flat. 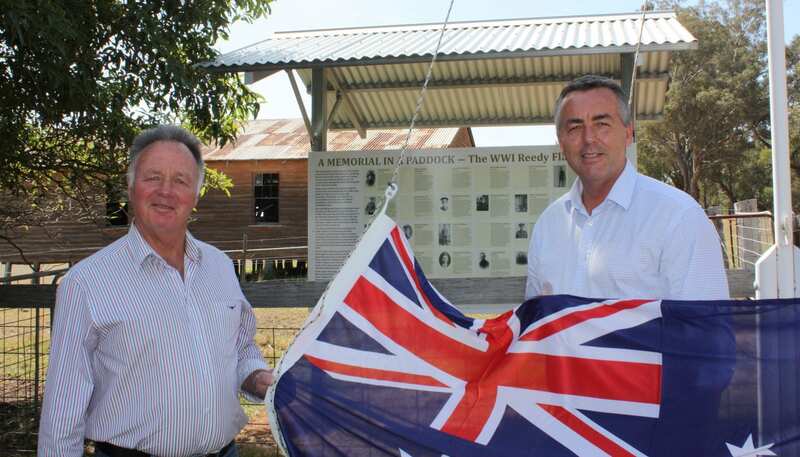 The Federal Member for Gippsland Darren Chester, who is also the Minister assisting the Prime Minister with the Centenary of ANZAC, said the Federal Government had provided $6,850 for the information board under the Armistice Centenary Grants Program. Mr Chester said Ensay-Swifts Creek RSL was one of a number of community organisations across Gippsland to receive funding through the grants program. “Visitors to this site can see the names of the soldiers from this area who served during World War One, read about their wartime service and view their photos,” Mr Chester said. “This information board is a permanent record of the sacrifice this community made during the war. It also helps to bring to life the stories of courage and suffering behind the names and dates listed on the nearby memorial. Ensay-Swifts Creek RSL erected the information board near the memorial on Hammonds Road. On Anzac Day, a dawn service is held at the site, attracting around 100 people. The RSL is now seeking funding for a second information board to be installed on the opposite side of the memorial. During his visit last week, Mr Chester presented Ensay-Swifts Creek RSL vice president Ken Skewes with a new Australian national flag. Mr Chester said each electorate in Australia was eligible to receive up to $50,000 to commemorate Australia’s wartime history and the 100th anniversary of the Armistice under the grants program.